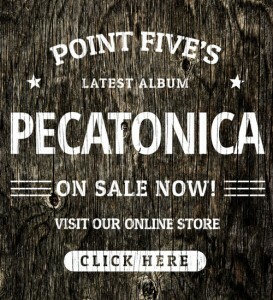 Based in the rural and historic lead mining town of Mineral Point Wisconsin, Point Five plays genuine acoustic music with an emphasis on Americana, folk, old-time, bluegrass and alternative country, often blending these genres with unique arrangements. Point Five and the charming town they call home are both like well kept secrets — you happen upon it from off the highway or wandering into the local bar and you tell only your best friends. While the secret is coming out (they were highlighted on WPR’s Simply Folk this year and are highlighted on a regional radio ad), the band loves to play local Dodgeville and Mineral Point bars and southwestern WI stages. The band consists of Monica (lead vocals) and Aaron Dunn (lead vocals, harmony vocals, rhythm guitar), Paul Biere (banjo, dobro), Andy Hatch (mandolin), Carole Spelic’ (double bass) and Meghan Dudle (fiddle). 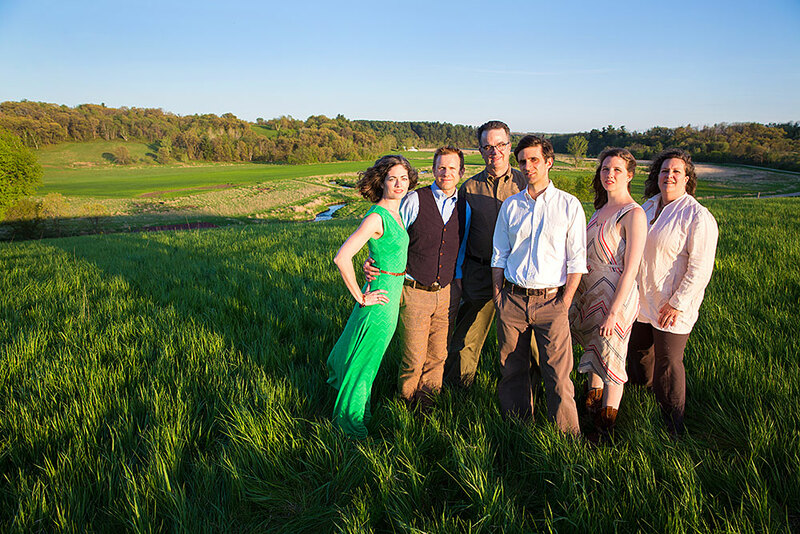 With impeccable and soothing vocal harmonies from the Dunn partnership, the steadiness of Carole, and dynamite instrumental breaks from Andy, Paul and Meghan, the band moves seamlessly through an array of songs and acoustic styles, including bluegrass, folk, originals, and gospel, with creativity and verve. They truly let the songs and lyrics shine through, leaving the listener with the emotional impact of the song itself. Their 2014 release, Pecatonica, named after the trout-stocked river that winds slowly through this area of The Driftless, conjures up picturesque scenes of the landscape of Southwest Wisconsin and explores the ideas of place and home, along with themes of rejuvenation and the effort love demands. The album is composed of almost all originals, a departure from their debut cd and displays the three year growth spurt the band has taken since their first release. Pecatonica takes listeners to the family table, and winds around what it means to leave the family table, remember it and grow into life without it.